“The Dead are following,” said Legolas. “I see shapes of men and of horses, and pale banners like shreds of cloud, and spears like winter thickets on a misty night. The Dead are following”. 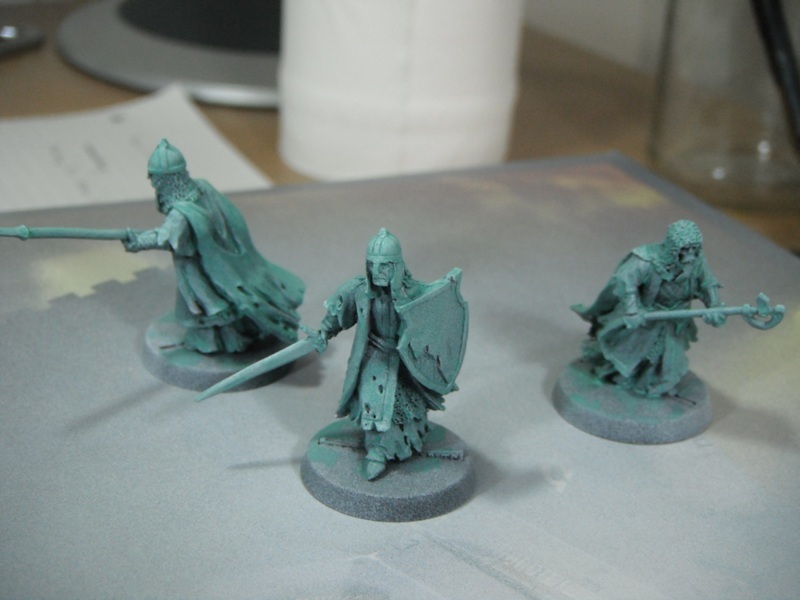 Here are my ‘Army of the Dead’ models from The Return of the King. I’ve had these models since their original release so it’s about time I got some paint on them. The painting process was extremely fast, making these the quickest models I have ever painted. In fact, the drying time was considerably longer than the amount of time I actually spent with a paintbrush in hand. In real life they are a tad greener than in the pictures and closer to how they appear in the film. 1) Prime the models black. 2) Spray the models lightly with Skull White. The trick here is to leave the recessed areas black. 3) Wash the model with Nihilakh Oxide. You will probably need two washes to build up the colour (make sure wait until the first is completely dry before applying the second). 4) Lightly drybrush the model white. That’s it! As you can see, this is a really quick method. These models are not going to win any competitions but the results are very pleasing considering the amount of time spent on them and they will look great on the tabletop. Currently painting some old LotR models and experimenting with Nihilakh Oxide.